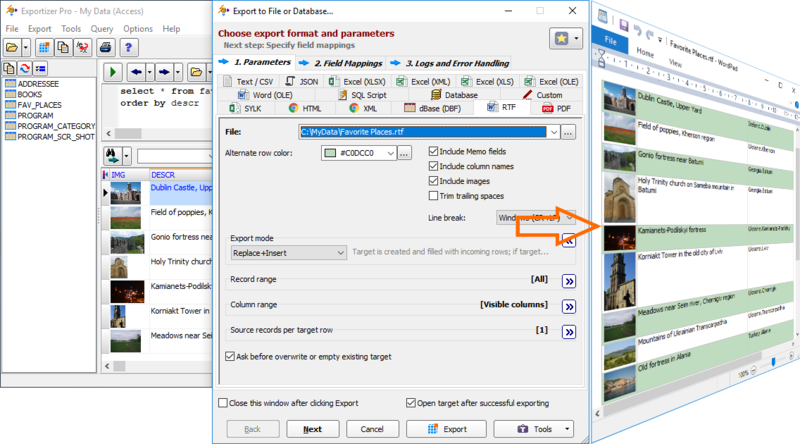 In Exportizer Pro, in addition to exporting data to different file formats, you can also export to relational databases: either to the same database or to another one. It can be Access to SQL Server, Interbase to Oracle, CSV to PostgreSQL, or almost any other database-to-database export combinations. 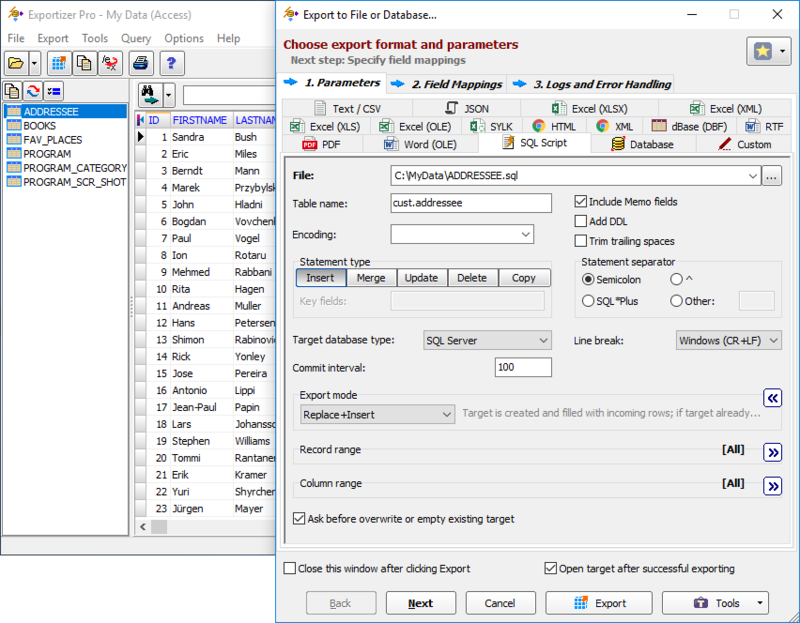 When exporting a set of selected tables, you can choose either to export them to different files (one table per file) or to one target file. 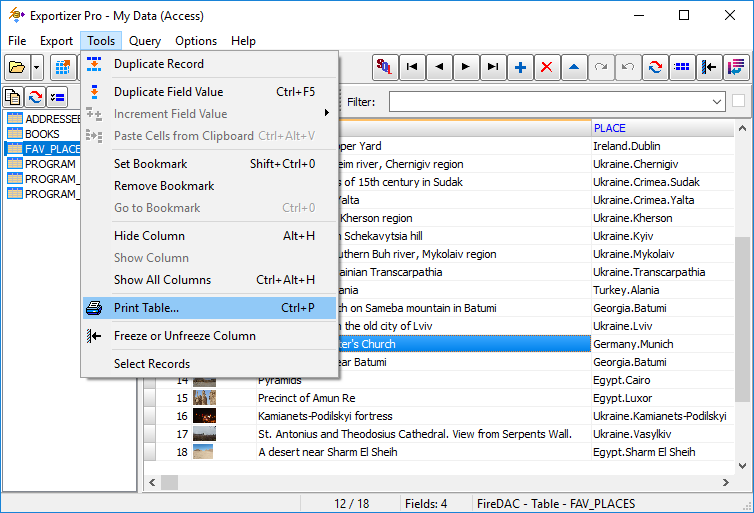 The latter option is available for XLSX, HTML, and RTF destination formats. To export multiple tables to another database (e.g. MySQL, Oracle, Access, SQLite etc. 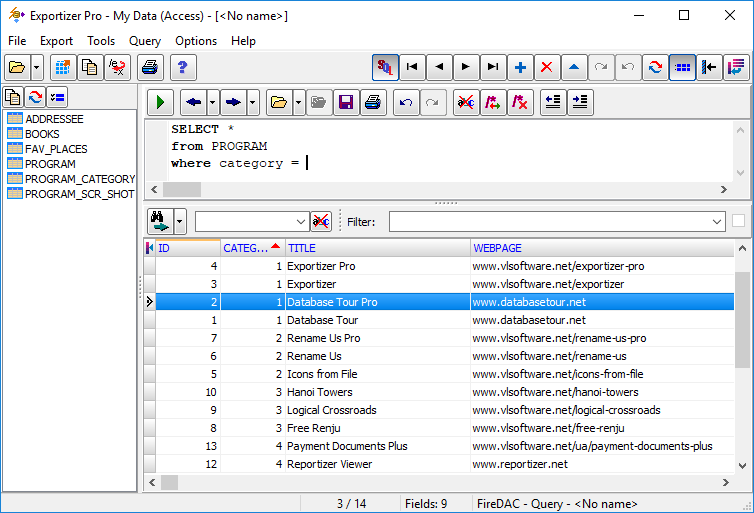 ), pick 'Database' target format and choose the needed destination database. You can specify source-to-target field mappings before exporting data. You can also add custom calculated fields here. 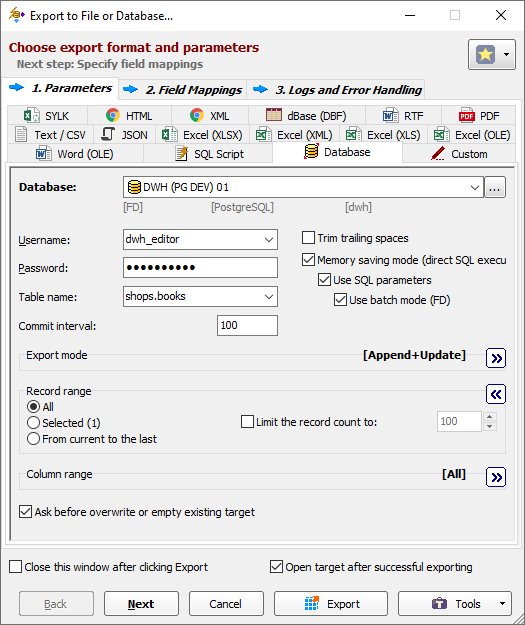 If exporting to relational databases, this data export tool can convert the source column types to target column types (see example of Access to PostgreSQL data migration on the screenshot). But anyway, it is possible to specify full target columns' specifications manually. 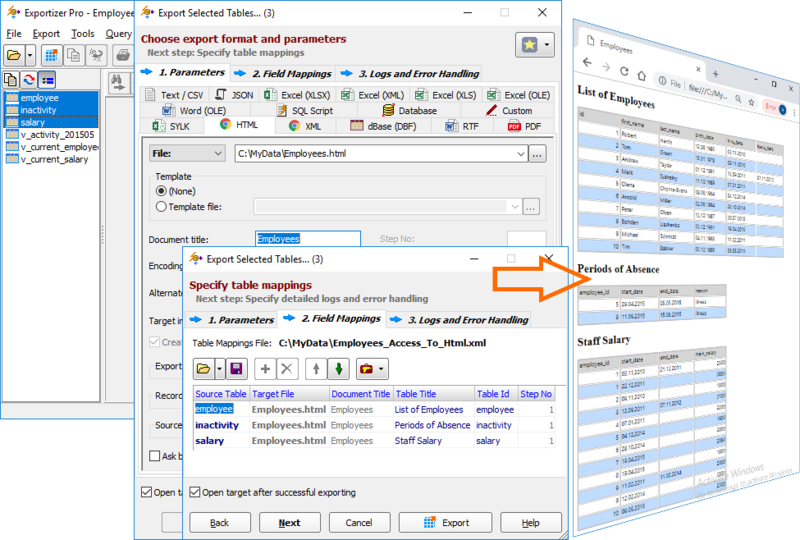 When exporting multiple tables, it is possible to specify the table mappings. The program can automatically detect the most known image types (JPG, PNG, GIF, BMP, ICO) in BLOB fields of a source database and export them, for example, to HTML, Excel, or RTF. It can also convert image format on the fly. 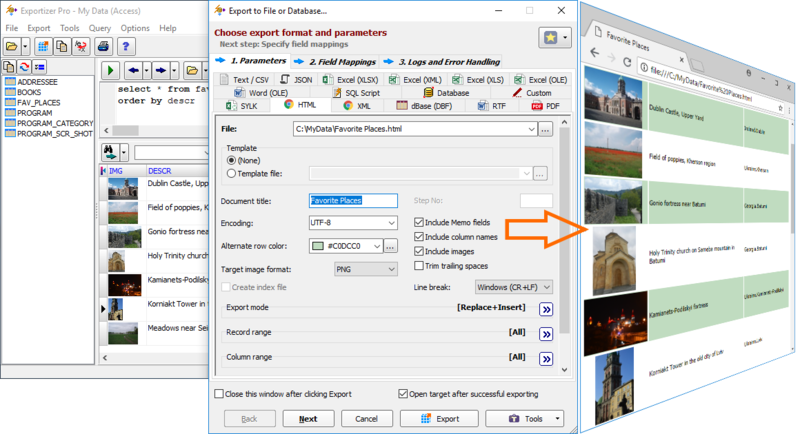 There is a possibility to export Blob data (images, large text, etc) into separate files in one export operation. Using HTML template allows producing highly customizable output, therefore target HTML file can be used directly in frontend without any further tuning. 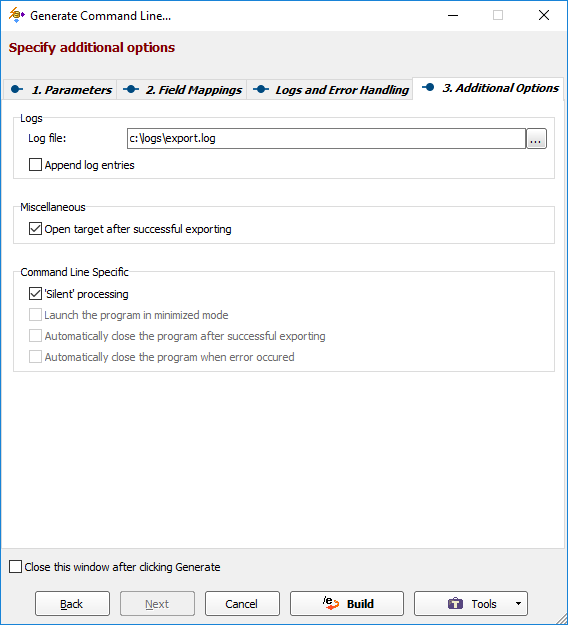 It is possible to choose the output format and specify many common export options as long as options specific to selected target format. 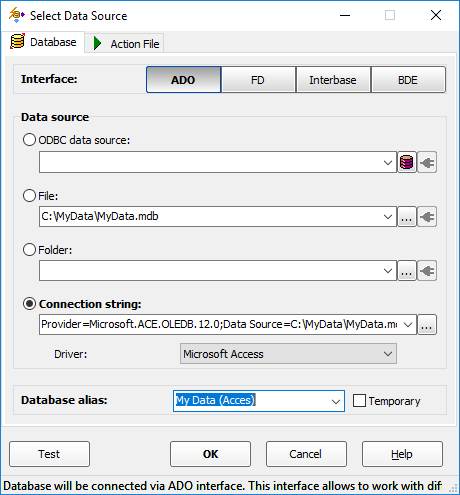 In Select Data Source dialog, you choose the database engine which you want to use for opening your data source and the data source like a file, folder, ODBC DSN, ADO connection string etc. Exportizer Pro allows you to write custom SQL queries. The result of the SQL query can be exported like it is done for a table from the table list. SQL editor gives you all you need to comfortably write the queries: SQL syntax highlighting, UNDO feature, loading and saving files, supporting of SQL parameters, storing history of executed queries etc. 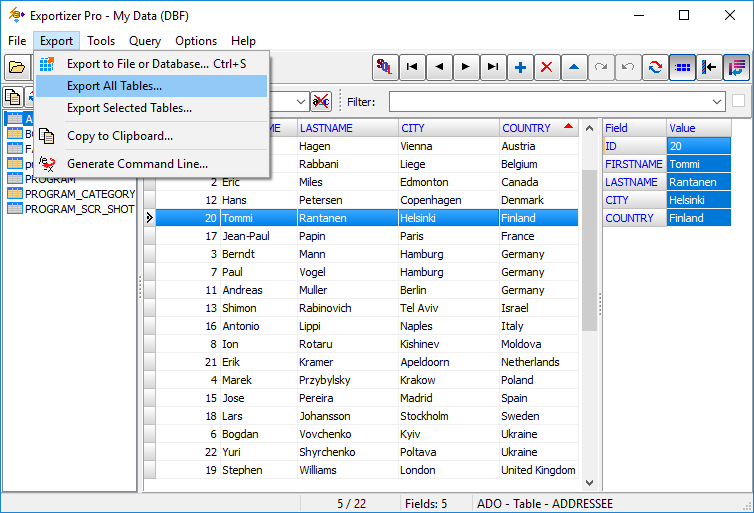 Export menu gives you ability to choose what to export: current table or SQL query result, several selected tables or even all tables of the database at once. You can also copy the data from the opened data source to clipboard. 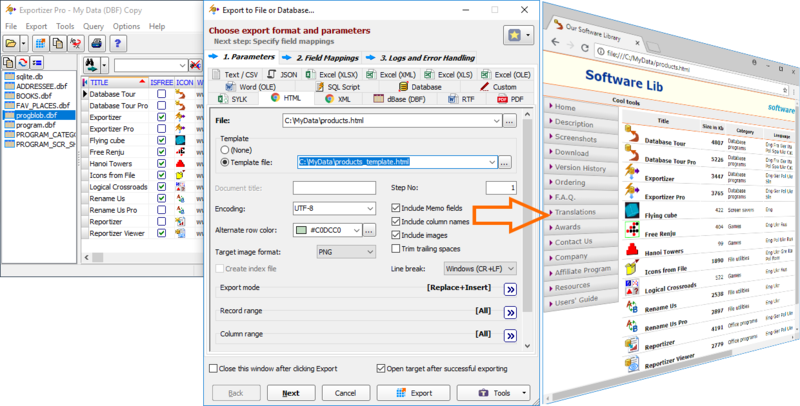 In Tools menu, there is a set of useful functions to operate with data: bookmarking, duplicating data, pasting tabular data from clipboard (copied from Excel, for example), printing data etc. Export operations can be performed also via command line. You can easily generate needed command line directly from the GUI using interface very similar to regular Export dialog.